A twenty-five year old Israeli is the first woman arrested for wearing a prayer shawl at Judaism's holiest site, the Kotel. It's the latest strike in the war between Orthodox rabbis and, in their words, the "deviants who serve equality." 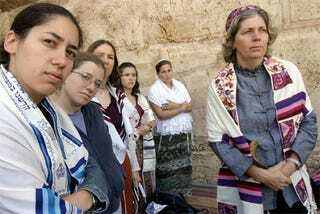 For over twenty years, a group called the Women of the Wall (some of the group's members are pictured above) has challenged the rules restricting women's access to the Western Wall in Jerusalem. Hewing to Orthodox rules and an Israeli high court ruling that upheld them, women are separated from men and are forbidden to wear tallit, traditionally reserved for men. Yesterday, Nofrat Frenkel and other women from Women of the Wall went into the main area to pray, and after protests from the Orthodox men regularly installed there, she was detained for two hours and ordered to stay away from the wall for 15 days. As much as Israel is riven by its disputes with Palestinians, long-simmering tensions between the ultra-Orthodox in Israel and more liberal elements have been exploding in recent months, including riots this summer and bitter, at times violent, protests over issues like keeping a parking garage open on the Sabbath. Over the years, the Women of the Wall have had chairs and feces thrown at them while praying. Ultra-Orthodox anger at Women of the Wall flared up afresh earlier this month when Israel's chief Sephardic rabbi, Rabbi Ovadia Yosef, lashed out at them during his weekly sermon. "There are stupid women who come to the Western Wall, put on a tallit (prayer shawl), and pray...These are deviants who serve equality, not Heaven. They must be condemned and warned of." Rabbi Ovadia Yosef established negative motives for the group of women praying at the Western Wall without knowing even one of the women. Because the motive of the group is awe of God, I invite him in the name of Women of the Wall to meet us and get to know us." An Orthodox man tells Israeli filmmaker Yael Katzir in her recent documentary on the Women of the Wall, Praying In Her Own Voice, "Women have their job to do and men have theirs. Women must teach the children, take care of the house, raise the children to observe the Torah and its commandments, and the man must go learn Torah." The role of women is a major front in the struggle over who gets to define Judaism and the use of space in the Jewish state. As Hoffman puts it in the clip seen here, "Israel markets the wall as a place of national unity. How can there be unity when half the population is silenced?"